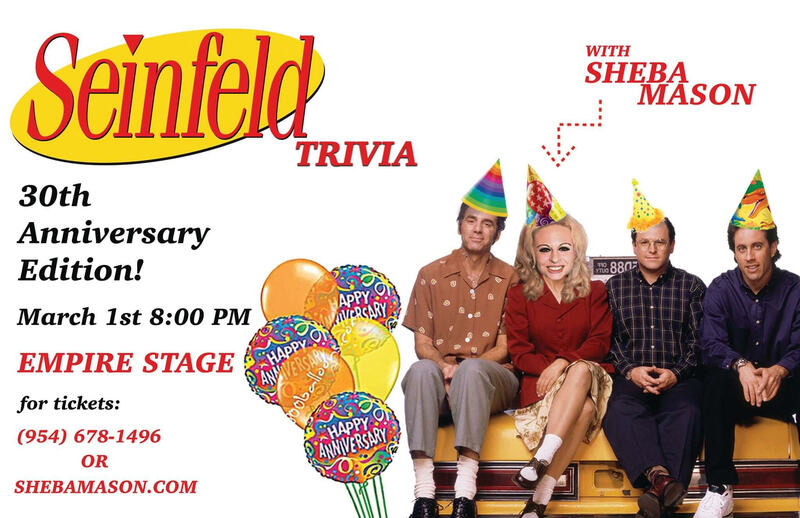 Seinfeld Trivia 30th Anniversary Edition! It’s been exactly 30 years since the world changed for the better and we gotta celebrate! The Emmy-winning hit sitcom Seinfeld ruled the zeitgeist in the ’90s with its memorable bits and catch phrases. Join stand-up comic Sheba Mason (daughter of Jackie) and David R. Gordon for a trivia contest, complete with with free wine, shot rounds, and cash prizes, that’ll test your grasp of such topics as “double dipping,” “regifting,” “man hands,” “puffy shirts,” “shrinkage” and “sparing squares,” and such characters as Newman, Art Vandelay, Uncle Leo, Puddy and the Soup Nazi- not that there’s anything wrong with that! To purchase tickets call 954-678-1496 or CLICK HERE.